1. Should I make reservation in advance or wait till I am in Hanoi? Once you have your travel plan, you should book cruise in advance. You will have time to check out which cruise suites your budget and meets your expectation. Some cruises have the Early Bird policy; it’s so good if you can enjoy the best services with better price than the others. Of course, you do also have time to compare the cruises at the same level. You will have time to set up some special request of rooms, decorations… for yourself or partners if your departure date is on the anniversary day. In the bad case you have to unexpectedly cancel the trip, you do get refund in specification time. 2. How can I book your Huong Hai Sealife Cruise Tours? - On the home page, you click to select which itineraries (2D1N or 3D2N) you want to attend. - Below of Tour Information, Click into "Book now" button and then follow to book Sealife Cruise Trip. 3. What time is the best to visit Halong Bay? Summer is the good time to cruise on Ha Long Bay but the best time is during the spring and autumn. Because the bay is situated in the Northern part of Vietnam, it can get cooler in the fall and winter, and though you won't see extremes such as blizzards, it's still a lousy place to be when it gets cold. 4. How far is it from Hanoi to Halong Bay? Halong Bay is located 170 km away from Hanoi, this would take you about 3 – 3.5 hours on bus transfer from Ha Long city, bus trip normally leaves Hanoi by 7.30 AM. We will be hitting the road for Halong Bay through the rich farmlands of the Red River Delta and the scenery of rice fields, water buffalo and everyday Vietnamese village life. 5. What if the weather turns very bad? Huong Hai Sealife often see the weather forecast, if the weather turns bad, we have to call our clients to inform the situation whether it’s safe to go. Same with Ha Long Bay, we work closely with our captains and will inform you before you leave Hanoi to Ha Long Bay so that you do not waste the day traveling on road. If the weather turns bad while you are cruising, we could anchor our junks at the hidden places, this is normally safe and Huong Hai Junks has not witnessed any bad weather that we have to hide in a cave. 6. Do you have life jackets on boat? Yes, that is one requirement in our Huong Hai Sealife Cruise, there are 2 life jackets in each cabin and there are enough life jackets for all passengers and crew team on boat. Tip: If you do not see this when boarding, please ask for the instruction from the crew members or our captain. 7. Can we sleep outside on the top deck of the boat? Yes, it is very nice to sleep outside there on the top-deck but please check this with our tour guide or the junk’s captain if the weather is fine to sleep outside. To note that we have very fine cabins designed with comforts of everything needed for a good sleep: natural rubber mattress, blanket, feather pillows and mosquito net and we can not bring this outside for you. Tip: That night we all stayed up drinking & talking about home and watching the shooting stars from the top deck. It was a wonderful time! 8. Where does the boat anchor at night time? Afternoon cruise to see the hidden wonders of Ha Long Bay, Huong Hai Sealife Cruise captain will find a suitable place (within the allowance areas) to anchor for the night, this place is normally inside the very calm bay surrounded by the islands. 9. Do we have to bring passport for sleeping aboard? Yes you do have to bring it with you on boat and please provide us your full names, gender, passport number, visa expire date before your departure to Ha Long Bay. 10. What do we have to bring with us to the boat? 11. 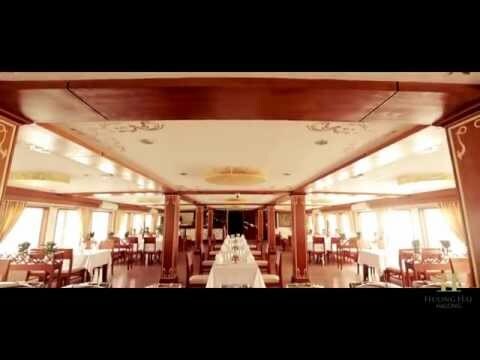 What kind of food on boat in Halong Bay? Most of the meals offered with seafood as Ha Long Bay specialty is seafood; there is lots of sea dishes combined with traditional Vietnamese food, I’m sure you will like the food on boat, if you are allergic with seafood, please inform your meal preference to our tour operator before your departure to Ha Long Bay. 12. Can I order meals to fit my special dietary requirements?